For people supported by CRS, it’s a warm and welcoming chance to meet more people, practice English, and share food and culture from around the world. Please bring a plate to share and a picnic chair, table and/or rug to use. There will be volleyball and a playground for kids plus good food and company for adults! When you arrive at Black Mountain Peninsula, look for us near the cul-de-sac at the end of Garryowen Drive. Please email us at actrefugee@gmail.com if you would like further information. Members are always welcome to attend Committee meetings – but please check as meetings are sometimes cancelled. Please note that we don’t have Committee meetings during school holidays. The sessions run from 7.00 to 8.15pm. Please contact actrefugee@gmail.com to check the date, location and time if you’d like to attend, or if you would like further information. 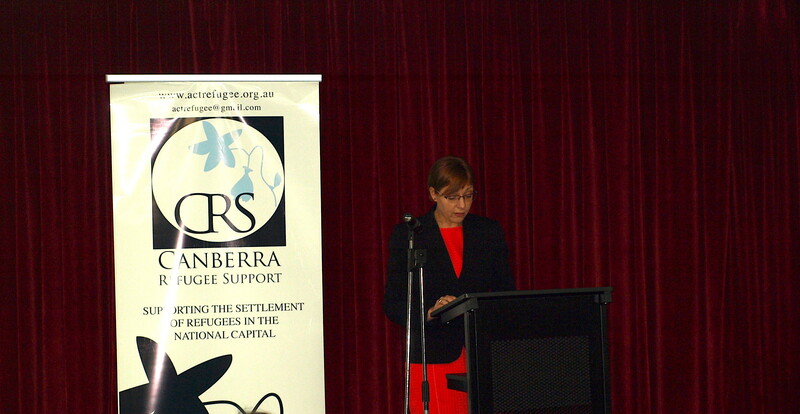 The annual 2018 CRS Fundraising Dinner was held on Thursday 18 October at the Hellenic Club in Woden. 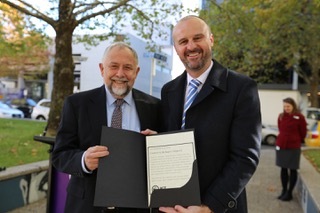 On 18 May 2018 the work of CRS over nearly twenty years to assist refugees settle in Canberra was recognised by a plaque on the ACT Honour Walk in Civic. The 2017 CRS Fundraising Dinner was held at The Hellenic Club in Phillip on Thursday 12 October. Once again, the Hellenic Club provided a terrific venue, with efficient and courteous service and delicious food. This is more than a club: worth making the effort to visit. Our first keynote speaker was Dr Kim Huynh. As an Indochinese Boat person, Kim discussed how proud he is of being a refugee and has increasingly come to realise how his refugeeness has shaped his personal and professional life as an academic, radio presenter and politician. He drew upon his article “Refugeeness: what’s good and not so good about being persecuted and displaced?” which can be downloaded here: http://mams.rmit.edu.au/k2gnu0t4iwu1.pdf. Kim has earned a BA (Hons) and a PhD in International Relations. He is a Lecturer in Politics and International Relations at the ANU College of Arts and Social Sciences. His areas of expertise are International Relations, political theory and political philosophy, literary studies not elsewhere classified and Australian government and politics. His Research interests are political theory, political literature, children and armed conflict, forced migration, Vietnamese politics and society. 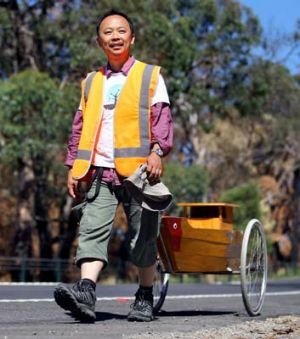 Kim Huynh’s family arrived in Canberra as Vietnamese boatpeople in 1979 and have been here ever since. He grew up working in the family bakery and can still make decent scones and slices. Kim wrote about his family and twentieth century Vietnam in Where the Sea Takes Us: A Vietnamese-Australian story – all the copies he had for sale (with all proceeds being donated to Companion House) were snapped up. He’s also published a collection of novellas about contemporary Vietnamese young people entitled, Vietnam as if… Tales of youth, love and destiny. He has published journal articles and book chapters on political theory, Vietnamese politics, women’s studies and refugee politics, and has written essays and opinion editorials for a range of Australian newspapers along with the BBC Vietnamese. Kim currently writes a column for the RiotACT. He’s a recipient of the ANU Vice Chancellor’s Award for Excellence in Teaching and lectures courses on international relations, political philosophy and Australian politics. He has supervised honours and PhD students in these areas. Kim is also a part-time presenter on the ABC Radio Canberra Drive Program and prior to joining the Drive team, Kim had a “Human Nature” segment on ABC Radio Canberra Breakfast in which he provided expert commentary on everything from hipsters to school reunions to the differences between Eastern and Western civilisation. Later in the evening we were privileged to have a second keynote speaker, Mr Paul Power, CEO of the Refugee Council of Australia. His speech was confronting as he detailed the facts and figures about asylum seekers and refugees, putting the political spin into a human context. Paul has been Chief Executive Officer of the Refugee Council of Australia (RCOA), the national umbrella body for 200 agencies working with refugees and asylum seekers, since 2006. Paul leads the organisation’s policy development and public education on refugee issues and its advocacy with the Australian Government, international networks and the Office of the United Nations High Commissioner for Refugees. Since 2012, Paul has served as a Steering Committee member of the Asia Pacific Refugee Rights Network. Paul has served as a member of the Australian Government’s Refugee Resettlement Advisory Council (2008-14) and as co-chair of the global Working Group on Resettlement and the Annual Tripartite Consultations on Resettlement (2011-12). The success of the dinner was due to the hard work of the organisers and their support teams. It is hard to single out individuals, but Morna again rates a special mention – thank you. And we again thank the wonderful Alex Sloan for being our MC for the evening – her friendship and professional relationship with Kim added a lovely atmosphere to proceedings. The fundraising events were also successful, so a big, heartfelt thank you to the organisers, the workers and to the various individuals and organisations that contributed the fabulous prizes. 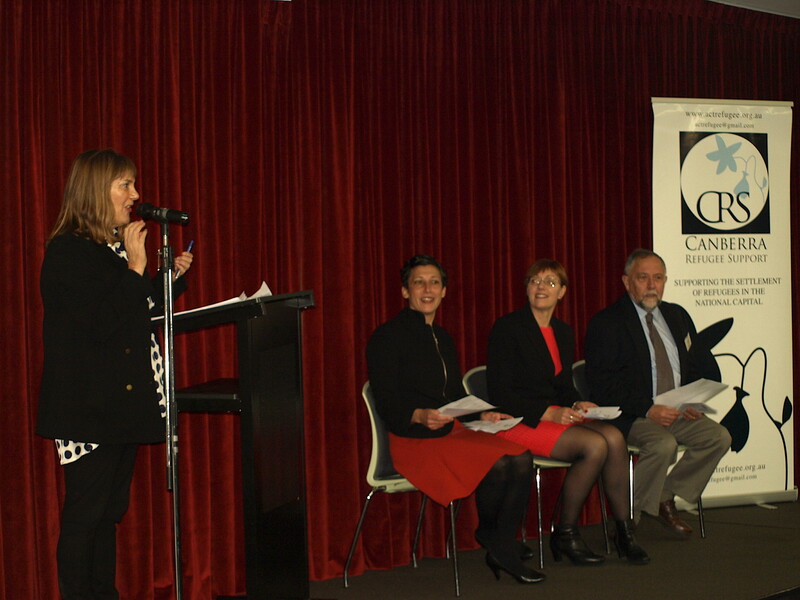 The purpose of the Canberra Refugee Support Scholarships is to recognise meritorious performance and to encourage and support outstanding refugee students in the pursuit of their personal development goals. Please click here for further information on the scholarship page. In total, 52 scholarships with a total value of $31,500 were awarded. Awards ranged in size from $300 to $1000 and were spread across primary, secondary and adult students with slightly more male than female recipients and nearly 60 per cent of the awards going to school and college students. Photo, left to right: Alex Sloan, Natasha Jacob, Rachel Stephen-Smith and Doug Hynd. Congratulations to all this year’s scholarship winners. We have many people to thank for making this year’s event possible.